"Where do you wanna go for your birthday dinner?" I queried Costanza last month. I think he suggested like 5 different places and each one I had visited recently. Right then and there, he knew the protocol - find another restaurant that we haven't been to. Hey, I have no objections to revisits, especially if the previous experience was poor, but not so soon! 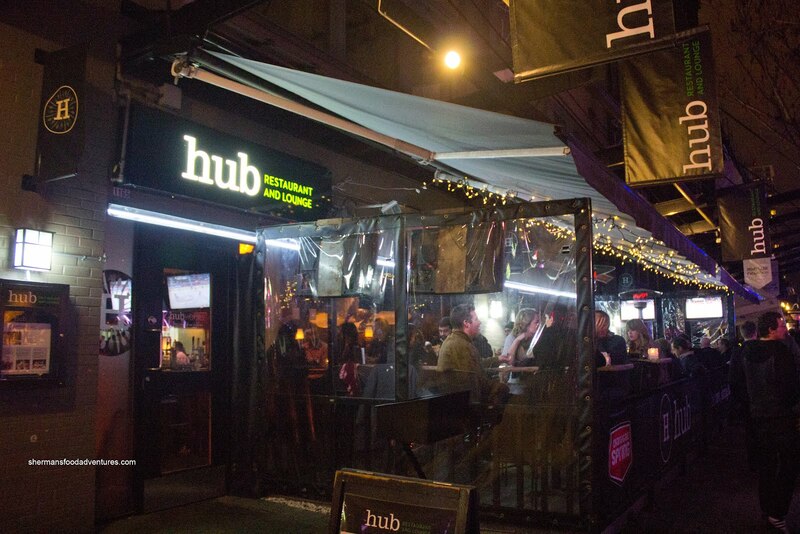 Finally, we decided on Hub Restaurant & Lounge in the heart of Yaletown. We ended up going on a perfect Saturday night when the Canucks were playing an away game. With the multitude of screens at the Hub, there are no bad seats. This was great. Food and hockey - 2 of my favourite activities... And about the food... Well... They left the ordering up to me and I almost pulled a Mijune (which is ordering everything). We began with a plate of Wok Squid tossed with garlic, chilies and ginger. For a non-Asian joint, I thought the Hub did a good job with this dish. Unlike some other places, the squid was thick and cut into large pieces. Hence, it was still moist and tender despite the fry job. Furthermore, the batter itself was crispy and golden brown. 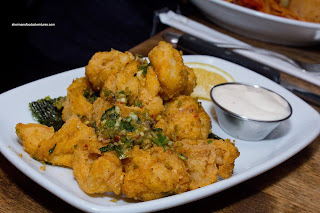 What really brough t everything together was the garlic, chilies and ginger tossed with the fried squid. 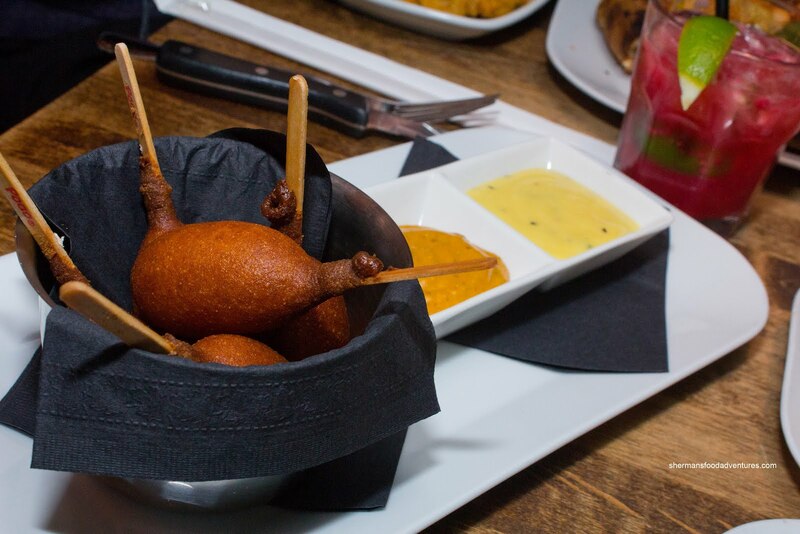 There was one thing on the menu that really caught our attention was the Double-Dipped Corn Dogs. When it arrived, the anticipation fizzled as the letters on the stick spelled out "P-O-G-O". Hey, don't get me wrong, we love Pogos. However, we were expecting something a bit more freshly-made. Now, to be honest, I'm not sure if it would've made a huge difference. So, it was mainly the principle and optics. The "original" part of the appie was the 2 dips consisting of honey mustard and grainy dijon ketchup. For us, the ketchup was the winner since it had a good combination of tartness and kick. Now for another item that I could not take my eyes and mind off of - the Lobster Wings. Huh? Lobster wings? Was there a meltdown at the Springfield Nuclear Plant or something? 3-eyed fish and now lobsters with wings??? No, not exactly. Rather, this consisted of knife-split, battered and fried mini-lobster tails. Served with clarified butter, this should be one of Hub's signature items. 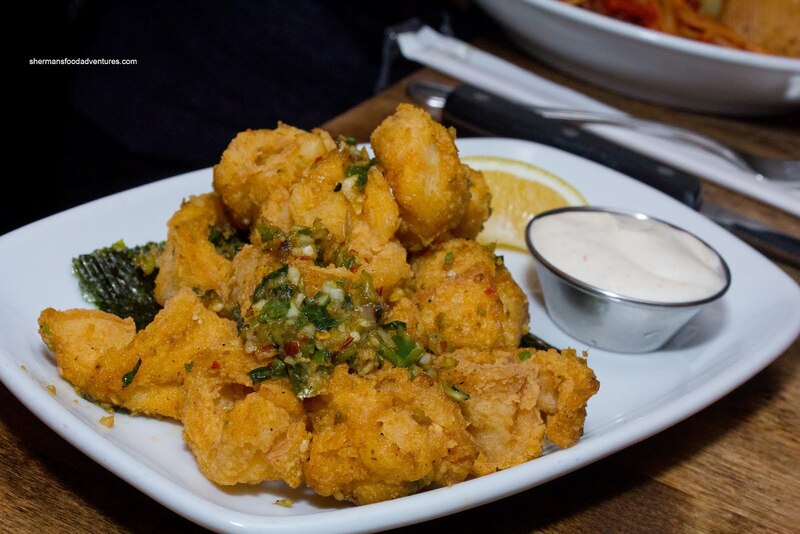 Hey, you got perfectly fried lobster and butter. What's not to like? Well, more seasoning pe rhaps. 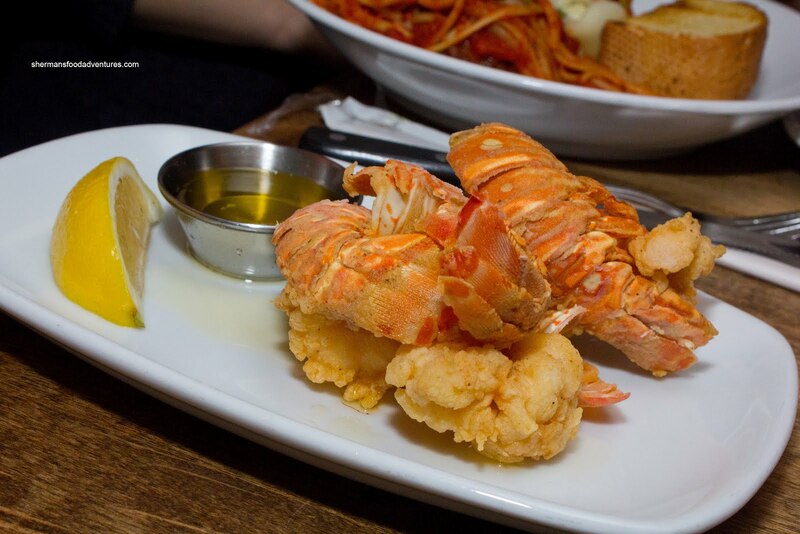 I realize that lobster is delicate and loads of salt or spices would just overwhelm it. However, there was little to no seasoning here. Maybe a touch of Cajun spice would put this over-the-top. As sort of a bridge between appies and mains, we had the BBQ Chicken Pizza. 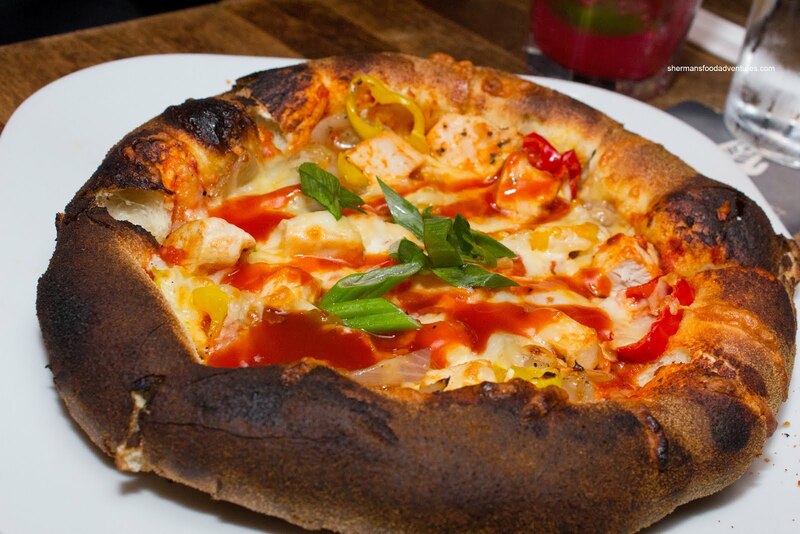 Some might think the darn thing was burnt by the looks of it, but that is exactly how we like it. Hence, the crust was crunchy, nutty and held up to the wet ingredients. I would've liked to see a less prominent edge to the crust though. Most of the components were spot on including the cheese, moist chicken and caramelized onions. Yet, we thought the spicy BBQ sauce was lacking in BBQ flavour and spiciness. Rather, it was mostly sweet and ketchupy. On the other hand, the banana peppers did add the necessary kick. Onto the mains, we started with the Crab Grilled Cheese. 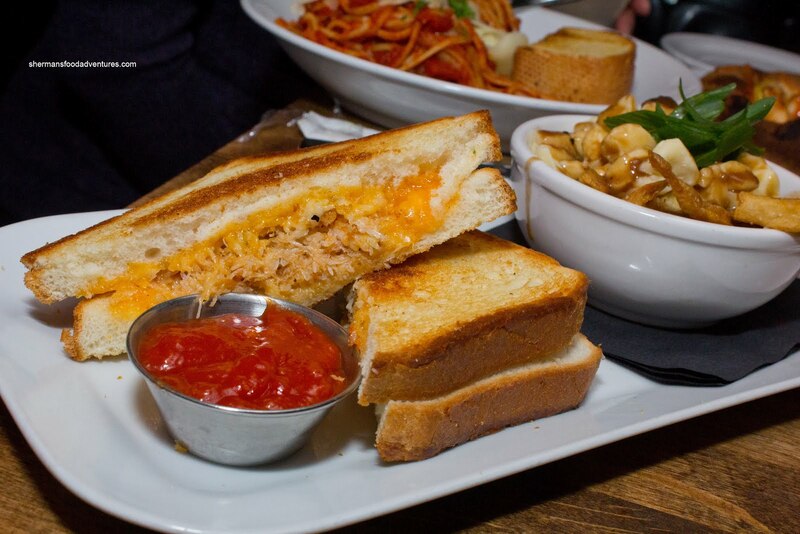 Initially, we feared that the crab would be lost and that the grilled cheese would be over-the-top oily. Both concerns were unfounded as there was more than enough crab to make an impact and the bread was only lightly buttered. Therefore, the sandwich was not really all that heavy. The bread was grilled crisp while the gruyere and aged cheddar cheese had fully melted and intermingled with the crab. Loved the addition of the vodka cocktail sauce since it added a zip and zing which livened up the flavours. 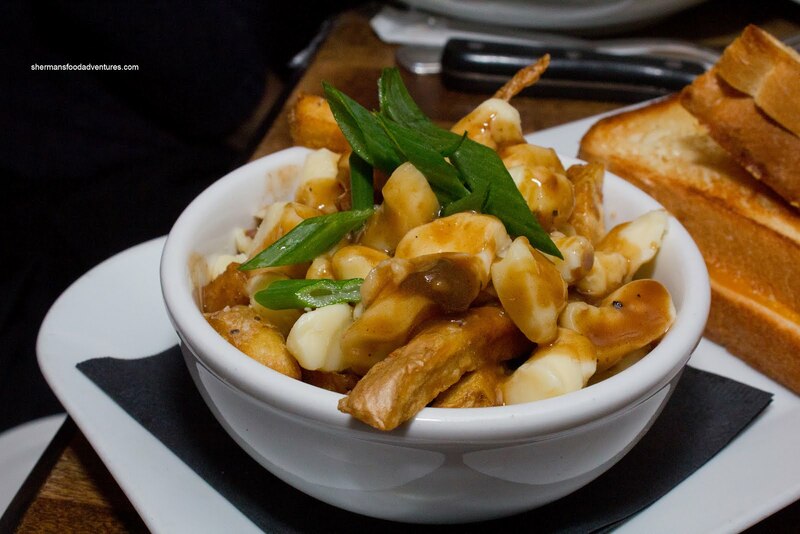 Instead of a salad or just plain fries, we upgraded to a Poutine instead. It ended up to be a generous portion which included a seemingly endless supply of cheese curds. It was a mostly decent poutine considering the gravy was flavourful and sufficiently thick. The fries could've been less dense and more crisp though. 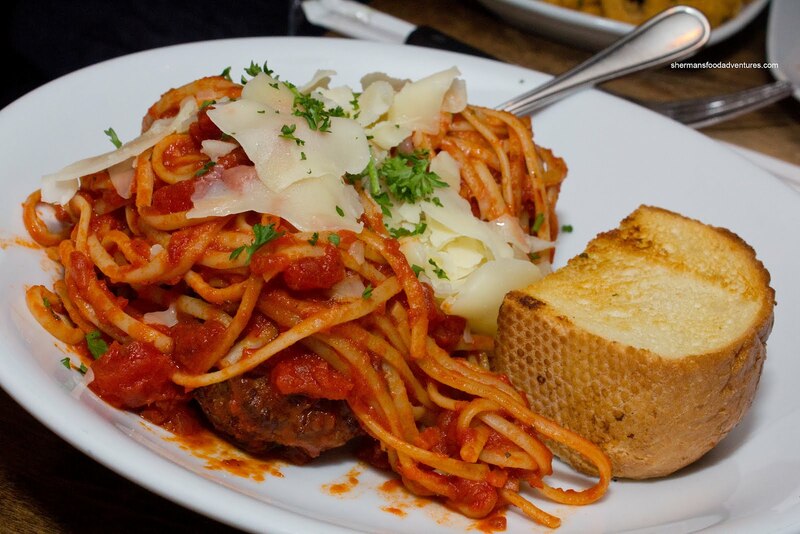 For a bit of variety we got the Kobe Meatball Linguine as well. Underneath the slightly past al dente linguine was 3 really large meatballs. These were very different though as the meat appeared to be hand-chopped and not very fine either. Hence, there was a considerable meat texture, which I personally didn't mind. Furthermore, there was not a whole lot of filler which made the meatballs loose. For Costanza, he was indifferent. Apparently he doesn't like loose balls... For me, it was different enough to be good. As for the marinara, it was mostly tomatoey and tart. There was nothing inherently wrong with it, yet it was a touch one-note. We also noticed there was a "burger bar" menu, so we had to get one for curiosity's sake. Our choice was the Yankee Burger consisting of an 8oz beef patty with smoked bacon, aged cheddar, lettuce, pickle and tomato. For good measure, we added mushrooms. This was a mostly solid burger that had no absence of flavour. The bacon was crisp while the meat was slightly dry. The other wet components made up for the dry patty. 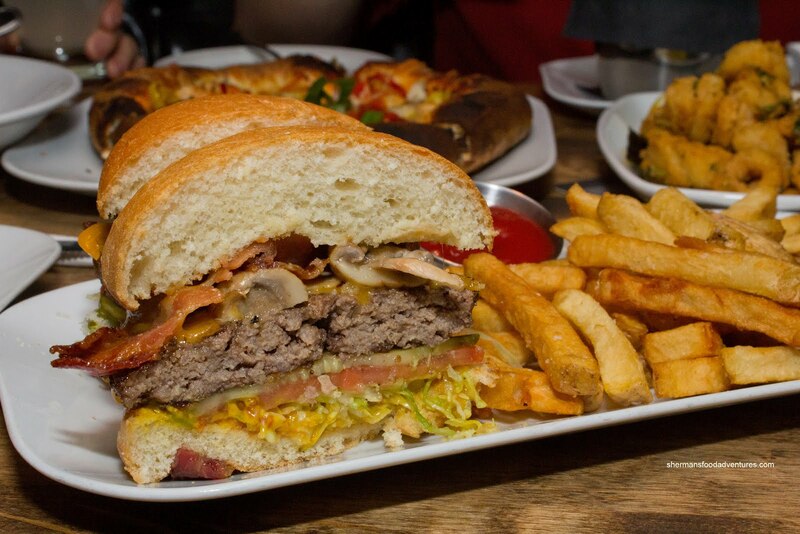 Just like the poutine, we thought the fries were dense and could've been more crispy. 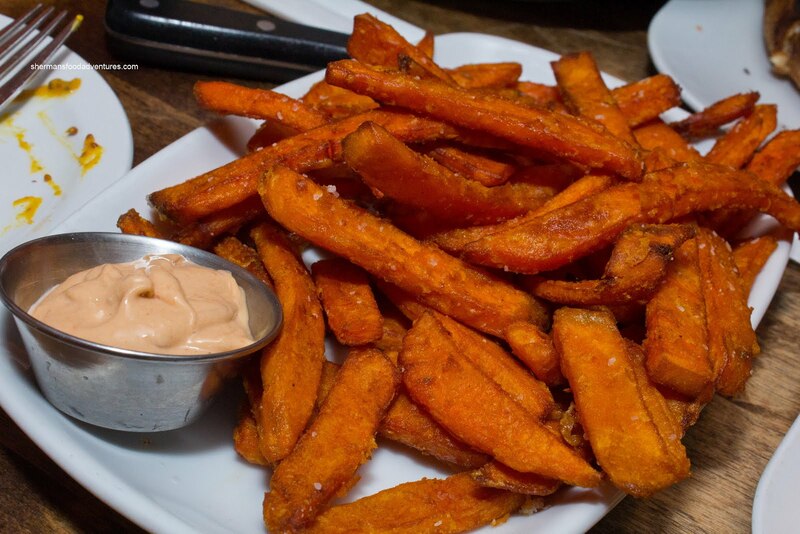 No matter though, they were a bonus because we had actually substituted it with Yam Fries. They forgot, but brought us out a plate of them quickly. They were crisp, not greasy and best of all, the chipotle mayo had a nice kick. Lastly, we decided to share a dessert because our server warned us of the portion size. 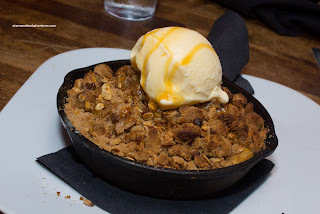 For $8.00, the Apple Crisp served in a cast iron pan could've passed for 3 desserts elsewhere. Unfortunately, we didn't really care for it. The individual components were good, like the big cuts of apple, the plethora of brown sugar, oats and a big scoop of vanilla gelato on top. However, parts of it were not hot and the topping needed more butter since it ended up being powdery. Furthermore, the whole thing was too sweet (maybe more tart apples and less brown sugar?). It was too bad the meal ended on an overly sweet note (instead of sour) because the food in general was more than acceptable. Keep in mind that the Hub is not a fine dining establishment. It is more about the comfort food. Sure, some things were better than others, but that is a given at any restaurant. For me at least, it is an option if one wanted to avoid the chain restaurants in the area and didn't necessarily want to break the bank either.